Minimum order with your imprint, 4. Quantity variation +/- 5% is possible & billable. A Tariff Surcharge will be added manually to this order: $2.00 per piece. 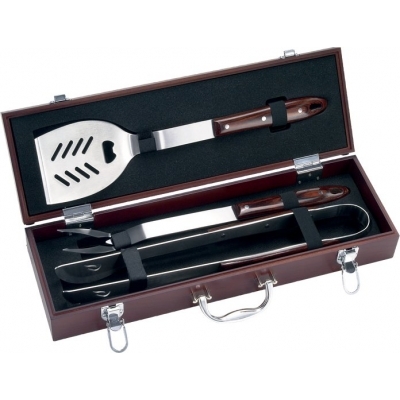 If you have "tasteful" clients who like to barbecue, this is the perfect gift for them. The first thing they will notice is the elegant wood carrying case. Of course, your logo is laser engraved, or color imprinted on the metal plate on the lid. The kit includes Tongs, Fork, and a Spatula with Bottle Opener. The utensils are made from 18-10 stainless steel, and Manchurian ash handles. The steel is FDA-compliant. Price includes your logo laser engraved on the lid plate. Price includes laser engraving on metal plate. Option: Full color imprint on plate, up to 3 sq. in. Extra charge shown above. Full color large imprint, $0.24 per square inch.